It's no secret I think you should have a carrying case for your army. And by that, I don't mean a cardboard box you toss everything into. Whether you buy one or make your own, you owe it to yourself to protect your minis. I will never understand it. I can't even pretend to. 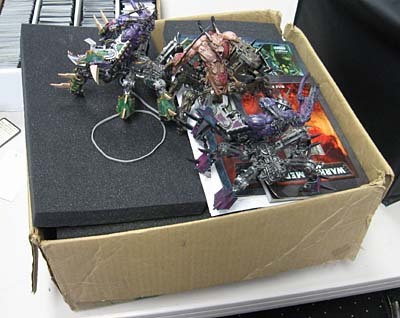 How you could spend hundreds of dollars on minis, hundreds of hours building and painting them and then throw them into a box for transporting them around. What!?! And there is no Part 1 for those who might be looking for it, I'm just using the same title I did when I first posted about this. I've always had something to put my models in. From the homemade to the professional stuff, I can't fathom not taking care of something I've invested all this time and effort into. And it's not like there aren't a ton of options out there. I may be beating a dead horse here since I've already posted about this before as a bit of a mini rant. This time though, I'm being constructive and offering some suggestions. Battle Foam and KR Multicase. Team Snake Eyes has a review of the Battle Foam PACK 1520 here. Pit of the Oni has a review of the Battle Foam PACK 432 here. Total Wargamer Blog has another review of the KR Multicase that can be found here as well. And there are others out there as well. It's worth doing your research and looking into what is offered by various vendors. Make sure you're getting what you need for your army. This is perhaps my favorite example of all time. 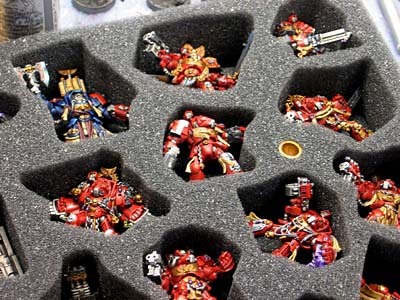 A foam tray specifically made for Space Hulk Corridor Game. If you take the time to paint your figures, you almost have to buy one of these. I don't know of a better way to protect them. And the thing fits in the box! Seriously, how perfect is that? 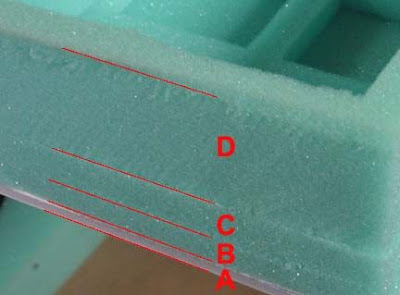 You can get this foam tray from Battlefoam and can find all the info here. Pit of the Oni has a great review of the trays here. In this day and age, there really is no reason you shouldn't be sporting something to carry your army around in that protects all the time and effort you have invested in it. 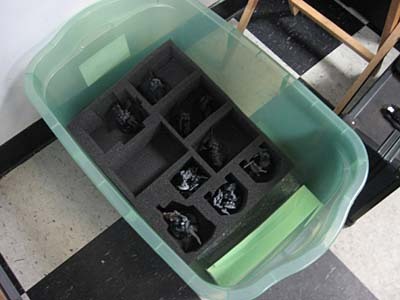 If you're going to go the plastic bin/tray route, at least go the distance like Warpstone Pile and magnetise your models to get the most of it and protect your minis. And it doesn't have to be fancy either. You can make your own if you can get a hold of the supplies. 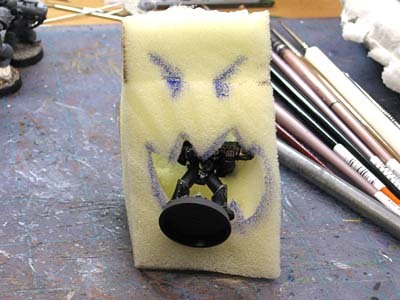 All you need is a suitable case, some high density foam, some white (PVA) glue and a blade. You can use and X-Acto blade for the shallow pieces, but will need a longer blade for the deeper pieces unless you layer your pieces to build them up to the height you need. NOTE: While this may save you a little bit of money in the end, sometimes it costs just as much as buying a real case when you're done. It will depend on the price you have to pay for the foam. 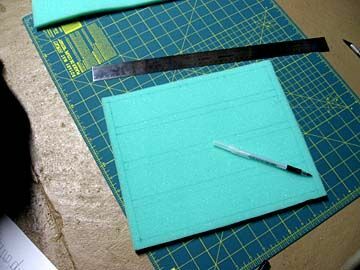 And while cutting the foam yourself is not hard, it destroys your X-Acto blades so make sure to have plenty on hand before starting. You can make your own trays to fit what you need to carry. I've labeled the layers to show you what I mean. All of the layers are cut with the X-Acto blade and glued together with the white glue. Like layers on a cake. A: Foamboard for the bottom to add stability. This can help tremendously, but is not 100 percent needed. 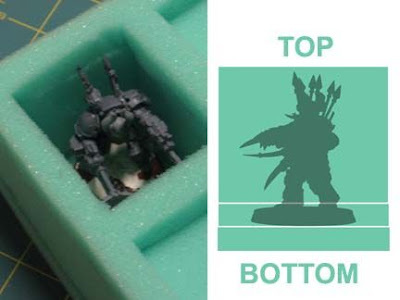 Depending on how much you cut away for model storage, you might want to consider adding this as a reinforcement only where you need it. This is what your minis will rest on. It doesn't have to be thick at all. I usually use half inch thick material for this. In this case, my models were just a bit too tall for just layer D alone so I went back and added another layer to give it that extra height (as seen in the top pic of the two here). This is one benefit of making your own case trays, you can truly customize them to exactly what you need and want. So there you have, how to get started making your own case and a couple links to some online providers if you want to go that route. Me, I'm lazy these days and buy my stuff already set to go. I used to cut my own, but found the time and effort to be so much that it was just as easy and about the same price to buy it off the shelf. UPDATE: I got started on this topic again recently when I realized I was seeing more and more "larger" models on the battlefield. I wondered, what do people transport all those huge models in? Actually, this is a bit of a pet peeve of mine too...I don't own enough storage for all my models, but feel a bit ashamed of getting to double figures for army cases, so a LOT of my models sit unceremoniously on CD and book shelves...or, if half-assembled, in cardboard boxes they came in. 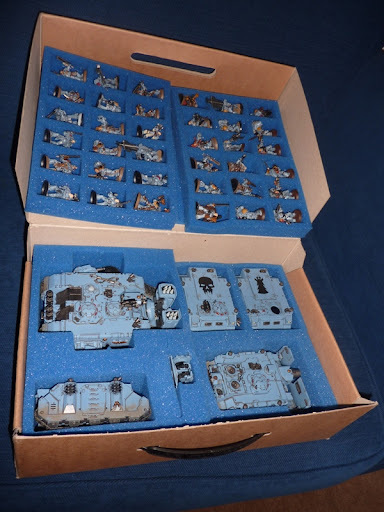 Six War Walkers in a Razorback box, for instance. I can only stand that as they are not fully built. When local gamers bring out a cardboard box full of loose models...or even take them out of their pocket (yes, really!!) to put on the table, I squirm at best. I think we have all seen that. Why bother painting them if you aren't taking care of them when traveling back and forth? I've seen the shoebox, the banker box, the bottled beer case, the plastic tub, with everything just thrown in them, maybe having some cardboard dividers. What gets me is if you ask those people, they complain about the cost of the miniatures, and they put a bunch of work into them, then they carry them around like that. Not sure I understand. I know most of you guys are not into the WAB or Fantasy scene, but magnetic base are the real rage for rank and file and movement trays. Slap a piece of sheet metal secured to the bottom of a plastic case and stick them down, they aren't moving, even if stored upside down. Granted not great for tanks and defiler type things, get foam for that. Magnets and foam, and a little bubble wrap to help with additional support on my over the top conversions. I have some older Sabol Army Transport/pizza carriers, I don't leave home without them. Look into pistol, bow, and rifle cases. They can often be found between 10-35 for a small case up to 75 for a long rifle hard case. They usually have egg carton type foam like the foam they pack figures with. I have several of these and they work just fine. 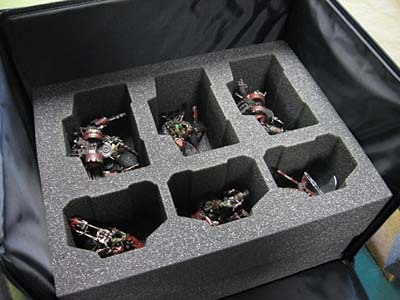 Agreed, with 2 large Forgeworld armies (Kried and Elysians) my cases are bomb proof!! For the most part, I don't like to use foam; it's better for getting toys from home to the store, but I (and when I say "I," here I really mean, "my wife") have found that it takes up kind of a lot of space. The_King_Elessar: I actually saw someone do that the other day. And to top it off, it was a model lots of long, fragile pieces branching out frmo it. PsychosisPC: I suppose once you magnetise the bases of your rank and file guys, it's only a natural extension to try and find a way to incorporate that into carrying them around. Ghostin: Interseting, wouldn't have thought of using those. The GunGrave: You have lots of money invested in those armies... cases should come with those models. Rushputin: Thanks for the link, I added it into the post.